The writer's notes in the program for Become The One tell us that in 2018, there were over 790 players on club lists in the AFL. Of those 790 there were no players who identified as anything other than heterosexual. While this is possible, it is highly unlikely, and in Adam Fawcett's new play, a high profile AFL player struggles to keep his relationship with a man out of the news for fear of ruining his career. 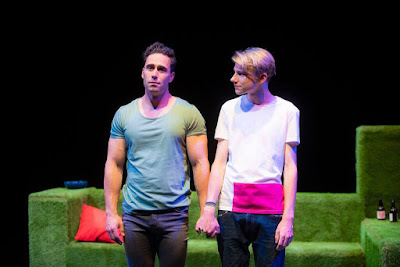 Chris Asimos (Tom) and Henry Strand (Noah) share great chemistry on stage, with both of them comfortable in their characters and in their more intimate scenes together. As time moves forward in the play, so too does the familiarity and affection the two have for each other develop. Fawcett's sharp and witty dialogue between them shows two people who are in love and devoted to one another but ultimately trapped by their circusmstances. Homosexuality, masculinity and sports are openly explored and rather than giving simple solutions to these issues, the script veers towards a more realistic and complex resolution. While the language used and the conversations between the two men have a deep level of authenticity, there are some narrative problems with the story. With Tom so concerned about being found out, it's hard to believe that a closeted high-ranking AFL player would invite someone he's only known for two weeks to move in with him. Furthermore, Noah's reluctance to take his shirt off while making love with Tom feels strange given they've been living together for weeks and so the scene where he removes his shirt feels more contrived than a moment of genuine intimacy. The show takes place entirely in Tom's lavish apartment, signifying how this relationship only exists inside those walls. Any ventures or references to the outside are always where the conflict stems from. Apart from a leather lounge chair and footstool, the rest of the apartment furniture is covered in artificial turf, constantly making us aware of Tom's career as an athlete. Become The One ask some interesting questions about how accepting we really are with regards to homosexuality. However Fawcett doesn't just approach this from a heteronormative perspective but also from within the gay community. As a result, we see a very human story of two complicated people trying to make sense of what they are willing to sacrifice for each other, and possible happiness.